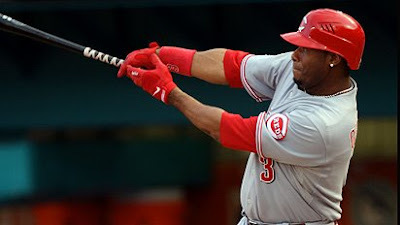 Ken Griffey, Jr. hit his 600th home run Monday night in a game -vs- the Florida Marlins against Mark Hendrickson. He is now in the company of Babe Ruth, Willie Mays, Barry Bonds, Hank Aaron and Sammy Sosa. It is a very prestigious and exclusive club, these 6 guys with 600 homers. Junior hit his first in his first at bat off the first pitch he saw from Eric King. He was then a 19 year old rookie making his first start on opening day in 1987. He was the first round draft choice of the Seattle Mariners that year, and he went on to hit 16 homers as a rookie. Other memorable dingers include back to back homers by the Griffeys Senior and Junior in 1990 off the Angels' Kirk McCaskill. This feat was a first in MLB history and hasn't been duplicated since. In 1993, Griffey hit a home run in eight consecutive games, which had been done twice before at that time. When he hit numbers 300, 350, 400, and 450 he was the youngest to do so. He was the one picked to catch Aaron, not Bonds. The talk then was not about 755, but about 800. Then the injuries began and the numbers fell off. When he hit 500, it should have been 600, except for the injuries. Same song , different verse now at 600 that could have been 700. But we all know that injuries are a huge part of sports. Some athletes are not as fortunate as others in escaping major setbacks. Just as for Griffey now, I always wondered what Mickey Mantle's numbers would have been, could have been, without the injuries and the self -inflicted abuse to his tremendously gifted body. But don't sell Junior short just yet. There are more significant home runs left in that 39 year old body. How about becoming just the third player to hit a home run in the Bigs as a teenager and as 40 year old? Or the fourth player to hit home runs in four different decades? Or even the first player to hit 300 home runs for two different teams in two different leagues? So Ken Griffey , Jr. is not a "what could have been" as much as he is a "what's going to be" ballplayer. His glass is not half empty. No way. His glass is half full. Now Junior, "fill 'er up"!